VELUX Modular Skylights use a prefabricated system that requires no on-site assembly, so your projects stay on time and on budget no matter what the weather brings. Spend more time designing and less time specifying with our modular advantage. Designed with architects in mind, VELUX Modular Skylights let you apply consistent specifications for any configuration you choose. They are also 100 percent prefabricated, allowing for complete control of production in our factory. From glass quality to motor power and speed, they are designed to work as a single system from the moment they’re made. Modular skylights are available in fixed and venting modules. 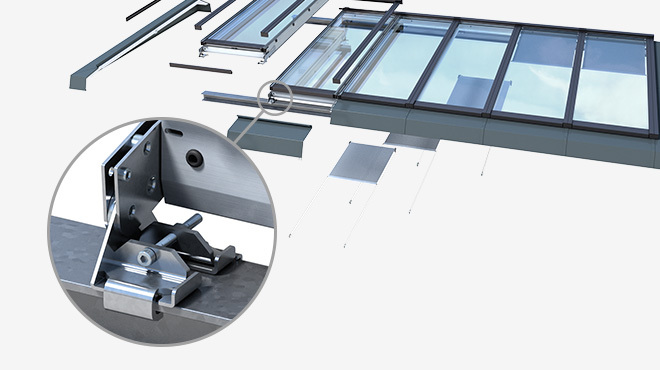 Due to a hidden chain actuator, fixed and venting skylight modules appear to be visually identical in the closed position. Venting modules are top-hung and can be used for both comfort and smoke ventilation. The modular system creates six different configurations for a wide variety of room and building types. Ideal for environments ranging from narrow corridors to areas permitting air circulation, each solution is delivered with prefabricated flashing that ensures a perfect 100 percent watertight fit. The VELUX longlight 5-25 degree solution is a single series of modular skylights that provides stunning lighting conditions to larger rooms, corridors and hallways. With its characteristic low-pitch design, the longlight fits right at home on flat roofs and other areas where a subtle expression is preferred. Longlight flashing allows for configurations with pitches between 5 and 25 degrees. Wall-mounted longlights are a series of modular skylights mounted against a vertical wall. This opens up a new range of design possibilities where the expression is not limited by the placement of the skylight. The flashing allows for configurations with a pitch of 5 degrees and 40 degrees. Wall-mounted longlights are mounted on a standard steel profile of 100 mm width at the wall. VELUX northlights are bands of modular skylights that are raised to allow sunlight to reach into the rooms below. The characteristic upright design is primarily targeted for installations that are directed toward the Northern Hemisphere for soft and reflected lighting and where direct glare is unwanted. The VELUX ridgelight 25-40 is a classic-looking solution consisting of two rows of self-supporting skylights that add natural light and openness to the areas below while creating a feeling of symmetry from the parallel lines of the ridgelight roof glazing. 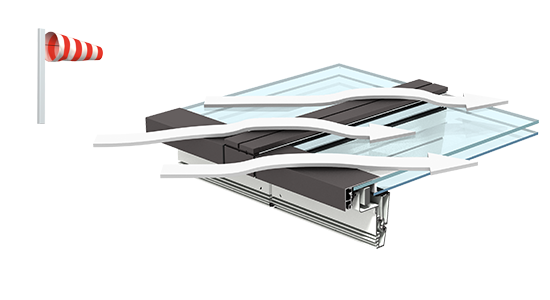 VELUX atrium solutions consist of multiple rows of longlights, supported only by structural beams, that form large glazed areas of identical-looking venting and fixed units. Designing your building with an atrium longlight solution will help you benefit from all the functionalities offered by the modular skylights system, such as integrated chain actuators, blinds and low pitch. 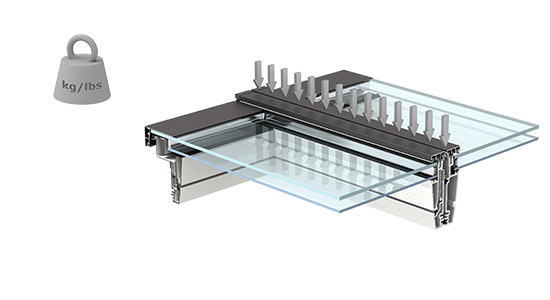 VELUX atrium solutions consist of multiple rows of ridgelights, supported only by structural beams, that form large glazed areas of identical-looking venting and fixed units. 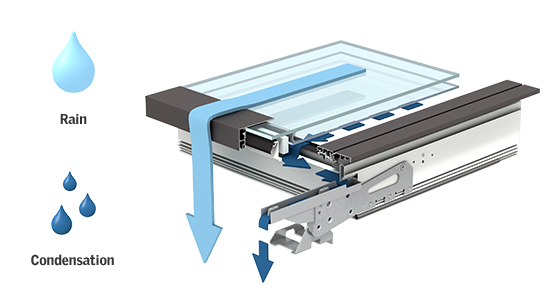 Designing your building with an atrium ridgelight solution will help you benefit from all the functionalities offered by the modular skylights system, such as integrated chain actuators, blinds and low pitch. From installation to operation, feature after feature exceeds expectations. 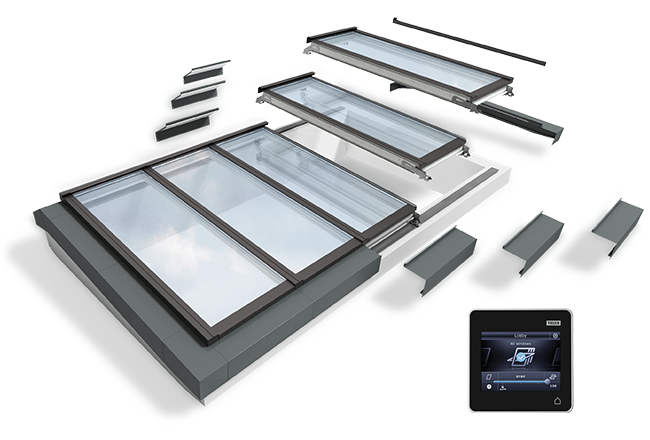 The world leader in roof windows and skylights, VELUX has brought more than 75 years of experience to designing our Modular Skylights. 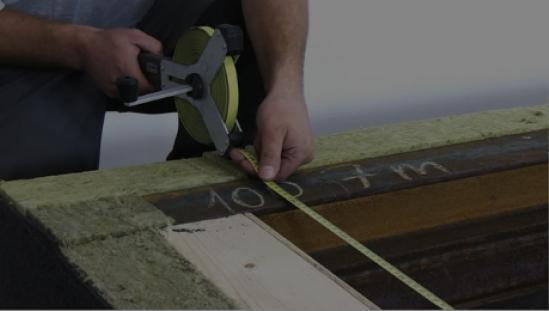 You can be sure we’ve considered the smallest details in order to provide ease of installation and operation alike. All components are designed in exact accordance to the overall system. In our controlled production facilities, we monitor all aspects to ensure a perfect fit and assembly. A unique bracket system with a simple clamp design guarantees a predictable installation process, which makes it possible to fit an entire module within minutes. 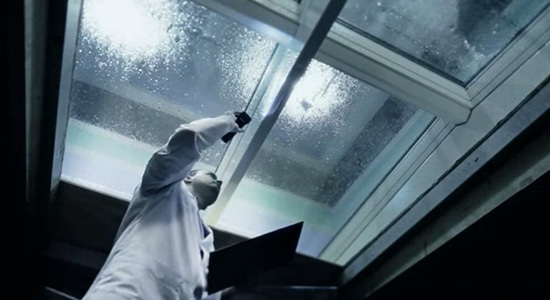 Every aspect of our modular skylights sets the standard for performance. Thanks to prefabrication, we are able to test our products extensively against all conceivable hazards and stressful events. 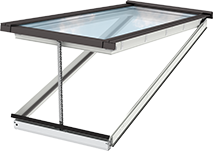 Skylight modules are fitted with a step pane to ensure water is led safely off the unit and onto the roof surface. Likewise, interior condensation is drained from the construction via a channel system that distributes surplus water to the roof. Modules are connected with a two-level gasket system that protects against air ingress due to excessive wind loads. The cladding, which is attached on top of the connected modules, contains several pressure compensation channels that reduce the load on gaskets and joints. The modules have obtained the highest classification for air permeability. The modular profiles are made of an extremely tough composite material. The strength stems from a highly specialized pultrusion process, which creates a rare combination of high flexural strength and unparalleled resistance to breakage. The unique mix makes the composite a safe and durable element as well as a strong measure against aesthetically unappealing deformation. Very low thermal conductivity and an array of low-energy glazing options make the total modular solution exceptionally energy efficient. The system offers two- or three-layer glazing in combination with three different coatings. The different combinations allow you to precisely specify the product according to your demands, whether you prefer heat control or protection against cold weather. 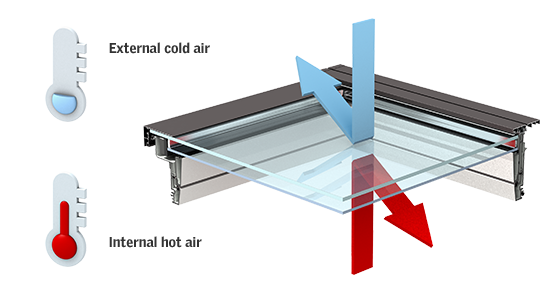 Modular skylights are fitted with a two-layer standard low-energy glazing unit. Alternatively, a three-layer glazing unit is available for projects that require extra low U-values. 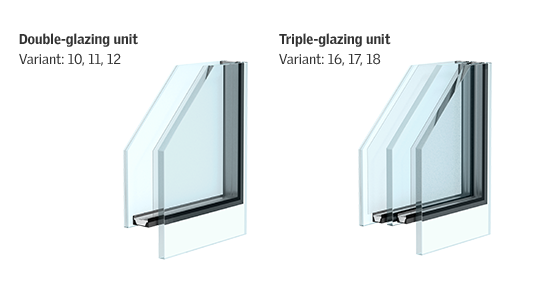 Both glazing units are available with different coatings for different levels of energy and solar protection and with foil-laminated inner glazing for added safety. Thanks to prefabrication, we are able to test our products extensively against all conceivable hazards and stressful events. Tests are performed in controlled environments and, even if only one component is investigated, results apply to all within our skylight concept. All products are manufactured, assembled and delivered from the same heavily controlled production line, leading to components with completely identical properties. Able to be installed up to three times faster than other rooflights, VELUX Modular Skylights are conceived to support the fastest imaginable installation process, starting from delivery on the construction site to fastening the final screw. The sub-construction is not part of the prefabricated modular system because modular skylights require an accurate fixed-dimensioned substructure. Likewise, the strength of the sub-construction needs to be calculated from project to project, based on the building design and application size. The complete system is delivered directly to your site. Each pallet is clearly marked with a letter, signifying the component’s order in the installation process. Clear packaging makes it easy to arrange the delivery on arrival and plan the following installation, so that each component is available at the right time in the right location. From delivery on the construction site to fastening the final screw, VELUX Modular Skylight (VMS) Rooflights can be installed up to three times faster than other rooflights. Modules are hoisted directly from the pallets onto the prepared sub-construction and fastened within minutes. Final flashing and cladding is applied with prefabricated components, built to fit. See how easy it is to install a Ridgelight Modular Skylight in five easy steps. 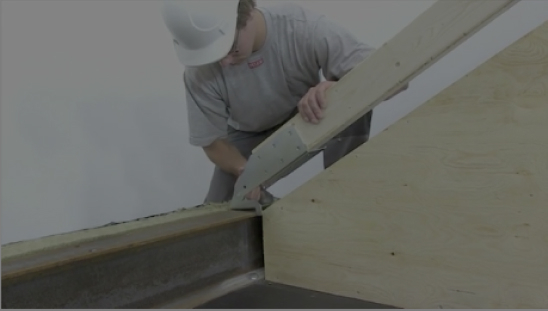 See how easy it is to install a Longlight Modular Skylight in five easy steps. Our 10-year limited warranty provides excellent assurance. See how we promise end users that our modular skylights and flashing will be free from defects in material and workmanship.